From American Board of Family Medicine, Lexington, KY (MRP, ARE, MD, RLP); Department of Family Medicine, University of Connecticut School of Medicine, Farmington, CT (MD). Diversification of the physician workforce has been a goal of Association of American Medical Colleges for several years and could improve access to primary care for under-served populations and address health disparities. We found that family physicians' demographics have become more diverse over time, but still do not reflect the national demographic composition. Increased collaboration with undergraduate universities to expand pipeline programs may help increase the diversity of students accepted to medical schools, which in turn should help diversify the family medicine workforce. Racial and ethnic minority physicians are important for the delivery of primary care to underserved populations.1 Physicians from underrepresented minority populations are more likely than white physicians to practice primary care in impoverished areas and in regions experiencing physician shortages2; however, a significant gap exists between the racial and ethnic composition of the general population and primary care physicians, family medicine faculty, and family medicine residents.2⇓–4 Diversification of the physician workforce has been a goal of Association of American Medical Colleges for several years4 and could improve access to primary care for underserved populations and address health disparities.5 Our objectives were to assess how well the racial and ethnic composition of American Board of Family Medicine (ABFM) diplomates (a proxy for the family medicine workforce) mirrors the national population and to determine trends by year of initial certification. Data aggregation resulted in matching 66,542 board certified family physicians by their year of initial certification, which ranged from 1987 to 2017. Compared with the US population, ABFM diplomates are more likely to be Asian (21.8% vs 5.7%) or Native Hawaiian or other Pacific Islander (0.5% vs 0.2%) and less likely to be Black or African American (7.8% vs 13.3%), American Indian or Alaska Native (1.0% vs 1.3%), or Hispanic or Latino (9.1% vs 17.8%). Non-Hispanic white diplomates are generally representative of the US population (61.2% vs 61.3%). The group trends for the past 30 years (1987 to 2017) in Figure 1 show the percentage of Black or African American physicians increasing from 1.3% to 7.8% and Hispanic or Latino physicians increasing from 2.3% to 9.1%. However, both groups remain substantially underrepresented compared with the general population. 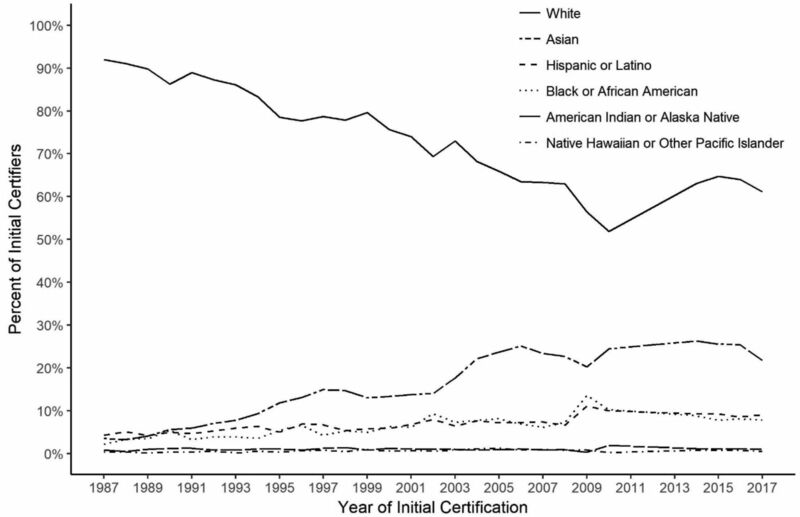 Proportion of board certified family physicians by group and year of initial certification since 1987. Our results indicate that efforts to increase diversity seem to have been effective for some groups but not all. Black or African Americans and Hispanics, in particular, have struggled to reach a mark representative of the US population. Although family medicine may have the most proportionate distribution of physicians to the general population,2 the specialty still feels the effects of a lack of diversity at the undergraduate medical education level. Medical schools should work more closely with their associated universities to increase the number of underrepresented minorities applying to medical school and ensure that these students are appropriately prepared for the rigors of medical school. Increasing the number of pipeline programs (e.g., Health Careers Opportunities Program) may help to recruit a more diverse medical school applicant pool, which in turn should help diversify the family medicine workforce. Conflict of interest: MP, AE, and RP are employees of the American Board of Family Medicine. To see this article online, please go to: http://jabfm.org/content/31/6/842.full. Received for publication April 26, 2018. Revision received June 21, 2018.
. Disparity in human resources: Addressing the lack of diversity in the health professions. Health Aff 2008;27:413–22.
. The racial and ethnic composition and distribution of primary care physicians. J Health Care for the Poor and Underserved 2018;29:556–70.
. Increasing family medicine faculty diversity still lags population trends. J Am Board Fam Med 2017;30:100–3.
. Diversity by design. J Grad Med Ed 2013;5:526–7.
. Minority physicians' role in the care of underserved patients: diversifying the physician workforce may be key in addressing health disparities. JAMA Intern Med 2014;174:289–91. U.S. Census Bureau. QuickFacts. Available from: https://www.census.gov/quickfacts/fact/table/US/RHI125216#viewtop. Accessed April 24, 2018.